Attending the Winter Fancy Food Show (which is a trade show for the specialty food association) is a terrific opportunity to see what's new and happening in the world of speciality food. The biggest trends I noticed this time around were teas with turmeric, beef jerky and fermented foods, which included kombucha, probiotic drinks (most dairy based) and raw live active culture salsas, pickles, kimchi and sauerkraut. Interestingly enough, they each have a health angle to them. Fermented foods provide probiotics which are healthy bacteria and yeasts. Turmeric has anti-inflammatory properties. Beef jerky can be a high protein and low carbohydrate food that fits with low carb and Paleo diets. There are lots of different kinds of fermented food and drinks. One is kombucha, which is a fermented tea, usually combined with fresh fruit juice to make a healthful and tangy beverage. I noticed at least three exhibitors offering kombucha to enthusiastic crowds perhaps because a couple swigs of it is particularly refreshing after lots of sampling and tasting of rich food. Kombucha is a natural product and the flavor can vary greatly from one brand and one flavor to another. I like a balance of sweet and tangy. One brand I particularly liked was Health Ade. All their products are organic and made with local seasonal farmers market fruit. The flavors vary seasonally. I tried several flavors liked the pink lady apple and the pomegranate. Something new this year in addition to the kimchi and kraut, were some fantastic spicy pickles and sauces both of which I’d recommend. The pickles I liked were from Dan Fruin’s company Genuine Grub. Dan was born in Korea, but adopted by Irish and Irish German parents. 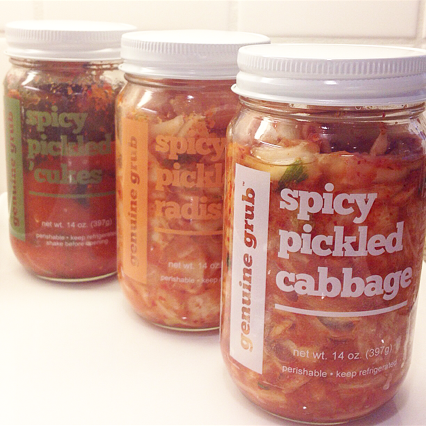 He makes spicy crunchy pickled cabbage, radishes and cucumbers without a vinegar brine. They have a better crunch and fresher flavor than other pickles. While I love spicy flavors, he also has a mint and dill cucumber pickle that had plenty of flavor without any heat. I also enjoyed Cultured & Saucy products. They make raw fermented salsas, sauces and condiments that are juicy and fresh. Created by a sisters in Santa Barbara. I particularly liked the lemon, garlic, dill condiment. It had a pleasing sour tang and would be great as a base for a salad dressing or on fish. They also make their unique products in flavors like citrus ginger curry and lime chile cilantro. Some of the products are called salsas, some chutney and another just “topper.” The names can be a bit confusing, these are all raw, fresh, fermented sauces that can be used in a variety of ways. Right now they are only available in Southern California. I wasn’t aware of the turmeric tea trend until I attended the show and saw it at practically every tea booth. Some tea companies have had a turmeric tea for a while and others were just introducing it. A top supplement, it has anti inflammatory properties and a mild somewhat earthy flavor. There are probably tons more out there, but these are the ones I noticed at the show. Numi introduced four all organic turmeric teas, Amber Sun with rooibos, honeybush, cardamom, cinnamon and vanilla, Fields of Gold with chamomile and lemon myrtle, Golden Tonic with lemon verbena and lime and another Three Roots with ginger and licorice. The turmeric plays more of a background note, so the tea you like best will depend on the flavors. Choice Organic Teas makes Easy Digest, a tea with organic ginger, organic licorice root, organic lemongrass leaf, organic turmeric. 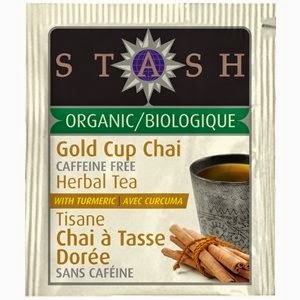 Stash makes Gold Cup Chai which is an herbal tea with organic cinnamon, ginger, turmeric, orange peel, cardamom and clove. The main flavor here is really ginger. It’s nice as a ginger tea, but I didn’t get much of the other spices. Spicely Organics makes Sweet Turmeric with organic turmeric, organic ginger, organic pure vanilla powder, organic cinnamon true and organic stevia leaf. I particularly liked this drink, the warm ginger, vanilla and cinnamon were enhanced with a bit of sweet stevia. Sorry I don't have a photo of it. Blame it on the low carb and paleo diets. Beef jerky is not just something you find at gas stations anymore! I couldn’t believe how many companies were exhibiting beef jerky. I also couldn’t believe how much of it was positively dreadful. Some was too chewy and tough, some was not chewy but dry and mealy like sawdust. But there were a few notable exceptions. The ones I found most tasty were the following three. Epic is specifically geared towards the Paleo diet and uses grass fed and organic beef in mixes that include things like nuts, coconut, dried berries or apples. They also make savory bars that are combinations of meat, nuts and berries. They come in flavors including beef, habanero and cherry, turkey with almond and cranberry and lamb with currant and mint. These were surprisingly good, tender with good texture and a savory and sweet flavor that was odd but tasty. Field Trip makes classic beef jerky, but it’s the perfect texture and the flavors are bold but not overwhelming. It’s lower in sugar and sodium than a lot of other brands. It's all gluten free and was created by three partners who wanted a better quality product without msg, corn syrup, preservatives, nitrates or artificial ingredients. The quality shines through. Uncle Andy’s Jerky has the most unusual flavors including Bandito Loco’s Spicy Coffee Beef, Lumberjack Maple Bourbon Beef and Southern Gent Lemon Mint Beef. All the flavors were a big hit at the show and created a lot of buzz. Andy wants to keep the price affordable and is looking into different means of distribution. For now you can check out the location finder or purchase it online.